RVing on distillery trails is the perfect trip if your taste buds savor the flavors of an Old Fashioned or Whiskey Sour cocktail made with small batch craft spirits. It’s never been easier to wrap an entire vacation around sampling the newest and best selections. Distillery trails are in every U.S. state. Small batch craft spirits are more popular than ever. In the U.S., about 1500 small distilleries are scattered from east to west, with more launching every year. Made with love by licensed mom and pop proprietors, these distilleries can call themselves “small batch” producers because they make under 750,000 proof gallons each year. They also aren’t owned or controlled by a large supplier. An industry report called The 2017 Craft Spirits Data Project notes that the popularity of small batch whiskey, vodka, gin and other spirits is quickly catching up with craft beer sales in America. RVing on distillery trails like Kentucky’s Bourbon Trail is a neat experience, but you won’t find much variety when it comes to the types of spirits being produced. If you’re out to cover a range of flavors, change your course of direction and go RVing in the top five states with the most craft distilleries. There’s nearly 550 distillery destinations between them (and counting!). 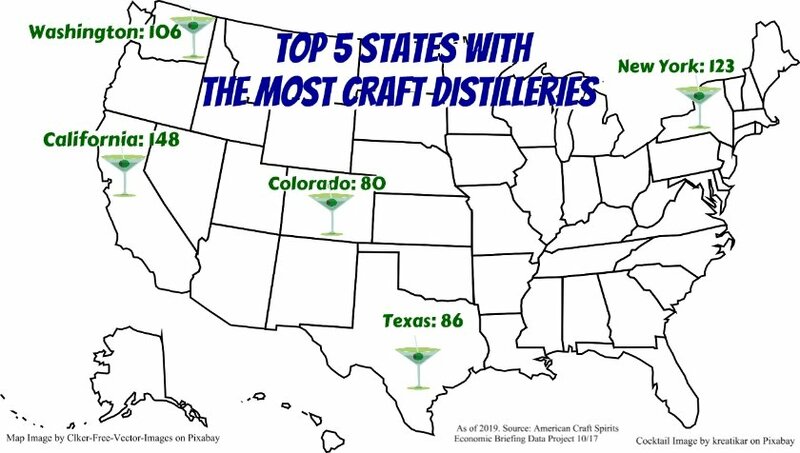 Distilleries in these five states make up nearly 35% of the entire craft distillery market in America. They also happen to have plenty of great places to park your rig so you can imbibe responsibly and generously. The Distillery Trail features nationwide listings of craft distilleries, many of which are located in close proximity to one another. 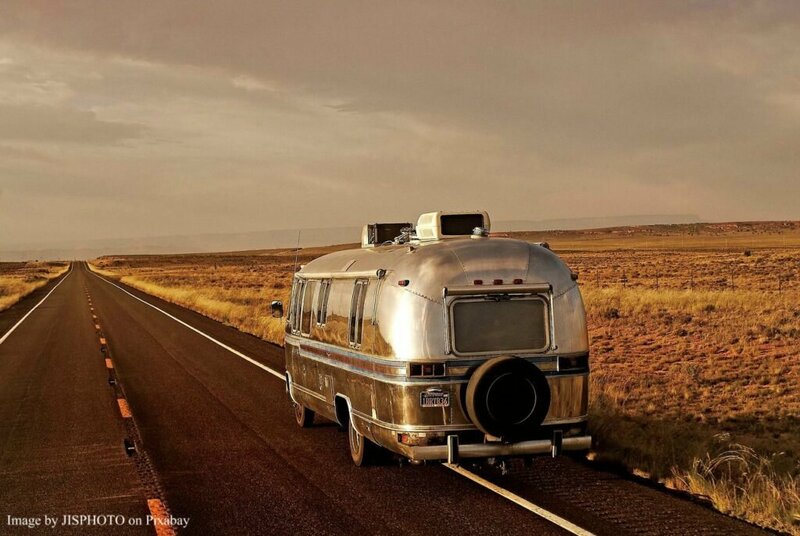 You won’t find better places to go RVing on distillery trails than the following five states. Over a dozen small distilleries are operating throughout Southern California. You’ll find them from San Diego to Palm Desert, up to the Ventura coastline. You’ll have a hard time deciding where to go RV camping in California, but you’ll find the real epicenter of California distillery operations to be in the San Francisco Bay Area. The majority of craft spirit makers in the state are doing business from Sonoma County to Lake Tahoe. You don’t need to maneuver your RV through Manhattan to sample craft spirits of New York. The biggest share of New York’s small, family-owned distilleries are pouring samples in New York’s RV-friendly summer destinations, like the Hudson Valley and around the Finger Lakes region. Craft distilleries boomed when Washington’s liquor laws changed. Today’s micro-distilleries can sell their spirits on-site and serve half-ounce samples as long at least 50 percent of their ingredients come from inside the state. The Greater Seattle area boasts more distilleries but you have many options in more RV-friendly destinations. You’ll find them in the Southwest quadrant, dotted along the coastline where Washington RV campgrounds and parks are plentiful. Texas state law doesn’t allow the public to buy more than two bottles per month from any one craft distillery. But restrictions like this haven’t stopped a craft distillery boom in the Lone Star State. Turn to Central Texas RV parks for the most choices. Then stay a while to enjoy the finest craft distilleries, from San Antonio to Austin, and west to the Hill Country. This state ranks fifth in the nation for the number of craft distilleries. But for many people, Colorado RV parks rank first for scenery and fun. The majority of micro-distilleries are scattered in populated areas along Interstate 25 between Colorado Springs and Fort Collins. But you’ll also find craft spirit tasting rooms in spectacular settings like Breckenridge and the Arkansas River Valley. The best way to plan RV trips with craft distilleries in mind is to check out RV Trip Wizard, a trip planning app made with RVer’s needs in mind. An internet search for “Distilleries in (state)” can also provide a long list of places to explore when RVing on distillery trails throughout North America and beyond. We do a wonderful wine RV trip into the North Carolina wine country. It’s a wonderful trip filled with fantastic views of the Blue Ridge Mountains and award winning world class wine tastings at local vineyards. Where else could you get peach cobbler and Apple Pie wine?? Shelton is my favorites place to buy the only true registered award winning port wine in the United States! The Shelton Chardonnay is to die for! You must do an article on the North Carolina Wine trail!!!! I think you misquoted Texas law here… Texas doesn’t allow you to buy more than 2 bottles per 30 days from any ONE distillery. I could visit 2 different distilleries per day and buy my limit at each, and by the time I got back around to the first pair more than 30 days would’ve elapsed and I could start all over again. My liver, on the other hand, would probably be toast in fairly short order. My point is that the limitation is on the distillery, not the buyer, and as long as you’re not visiting the same distillery over and over again you’re never likely to run afoul of this regulation. Whew! You’re right David, thanks for the clarification.